May 1980. U.S.Naval Academy. Awards ceremony for the Class of 1980. Here I am as a firstie. I had been on the plebe summer detail, dishing it out worse than I got it. In fact, years after I left the Navy, one of my former plebes came to work at the engineering company which I worked for while writing Voyage of the Devilfish, and I left him a note reading "Brace Up!" He glared at me for the next year and could barely speak to me, ten years after his plebe year had gone down in history. 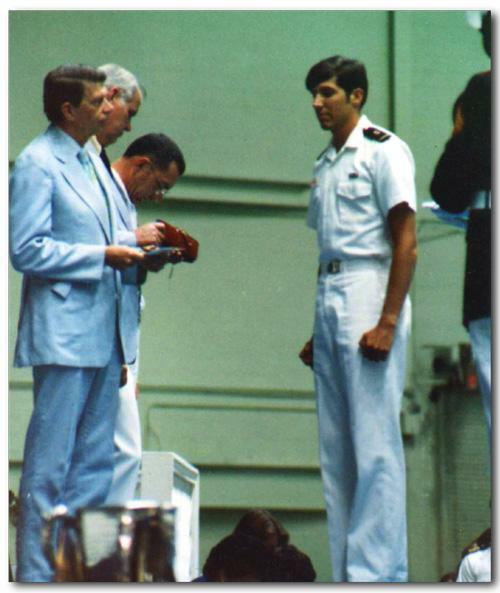 In this photo, at the awards ceremony, I got the triple crown - highest GPA, best mechanical engineer, and best nuclear power candidate (and two years later, almost flunked out of nuclear power school - that story later). So here I was, at the end of the day, finally successful, after nearly being run out by the firsties and my own dismal conduct grades (I parked in the admiral's space as a firstie and got called into the Commandant's office to explain myself). And fame and success lasted about two minutes. A month from this photograph I would be a grad student at MIT, alone and lost and confused, the dumbest kid in classrooms full of amazing geniuses.